Are you looking to help pay your boat finance? Renting to overnight guests is a low cost, low commitment alternative to chartering and can help you offset the cost of ownership. Here we take you through the benefits and an owner case study to show how Beds on Board can help pay your boats finance. Firstly, lets talk about what you are offering. We have guests searching to stay on boats all over the world. The boats don’t move, it’s accommodation only. You won’t have any engine hours or other costs associated with chartering. Our guests can only book boats and they will communicate with you directly via bedsonboard.com, so they will know what is expected. They can only book if you approve their booking request so you are in complete control. From the guests point of view, they will be looking for a unique and memorable experience which all starts with your listing. Make sure you have great photos – you can read this blog post to help you take photos like a pro. Write enticing descriptions of the boat and the location. Also make sure your pricing is competitive based on what’s on offer – number of cabins, age of the boat and what’s in the area. We can help with all of this if needed. Tip: Imagine your ideal guests, what they will enjoy and where they would stay if not on your boat. Then make your listing, pictures and pricing attract them! We know that most owners finance their boat to keep cashflow for other things! Therefore we decided to look at how Beds on Board could help pay your boats finance. The majority of our owners have boats in the 30 to 60 foot size bracket (although we have lots of bigger boats too!). Of these boats the majority again are likely to be more than 5 years old. Of course this is an example and the financing and income will vary depending on the boat, location, and season but it may help show how Beds on Board can help you. Like what you see? 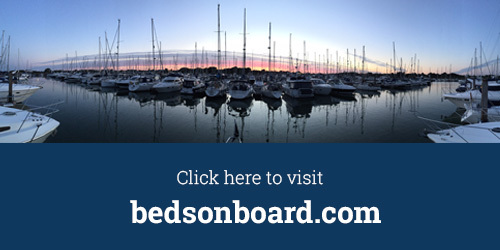 List your boat for free now at bedsonboard.com. Do you have boat finance? Do you want to help pay the monthly fees? Or your mooring fees? We have experts here to help you list your boat so give us a call now on: +44 (0) 203 795 5006. « Valentine’s ideas | The perfect Valentine’s day gift for him…or her!